It was moments before the Wildcats season-opening kickoff against BYU. Arizona huddled as a team, but the scene was far different from past season openers. 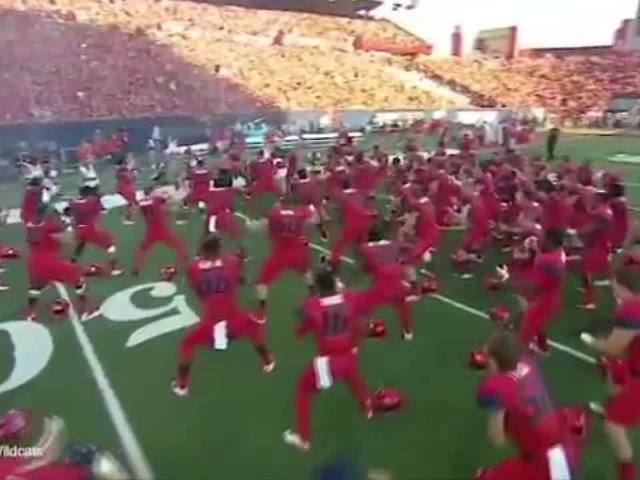 Arizona had performed the Ka Mate haka. It's not a dance, but rather a war challenge native to the Mauri people of New Zealand. "It's huge," said nose guard Sani Fuimaono, who is from Hawaii. "It's bringing our team together as one, and uniting us before we go to battle." 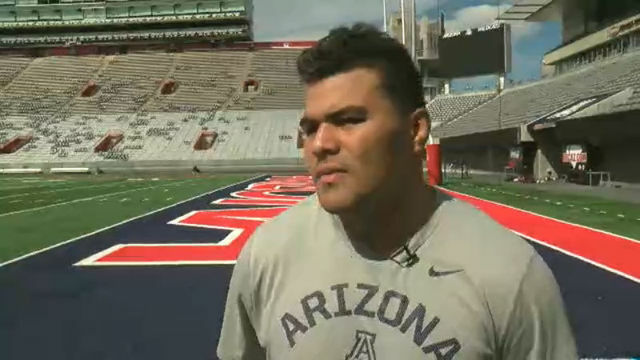 The Wildcats, who typically have several Polynesian players on their roster, started the tradition back in 2009. It was a way to honor their heritage. "It means everything to me," said Fuimaono. "It keeps me grounded. That's my root. No matter where I go, I'm forever Polynesian. I'm Samoan, and I take pride in that." What started out as a Polynesian ritual was embraced by teammates, and it became a pregame routine. However, on September 26th of last year, an ESPN telecast of the Wildcats game against UCLA caught they eye of Cal-State Northridge professor Christina Campbell. Campbell was outraged that the Wildcats were performing the Ka Mate, made famous by the All Blacks Rugby team in New Zealand, poorly. Campbell declined to be interviewed for our story. She did make her comments known in a change.org petition last year, calling the performance a "circus" and an "affront" to the people of New Zealand. Not to be outdone, Wildcat fans started their own petition. "I've learned more about the Haka than I ever thought I would," said Wildcats athletic director Greg Byrne. "We listened. We tried to understand why. At the same time, we also wanted to support guys on the team. As it continued to pick up steam, we asked Sani and some of the guys, can you just hit the pause button for a while, and that's what took place last year." So Fuimaono was left with a choice. Either clean up the Ka Mate, don't do a war challenge, or do a Haka unique to Arizona. He chose the latter. "I think a big thing was just, how much the team thrives upon it, and the community and the fans," said Fuimaono. They were missing it, and it definitely kind of became a tradition here." Fuimaono, who learned the Mauri language in middle school, began to compose an original Haka. "Why not give the U of Arizona, give Tucson, give the team something their own that means something to them." Fuimaono worked for months to compose an original Haka. It's called the Kopeka, the Mauri word for Wildcats. "More than doing a cool Haka that looks intimidating, there's a meaning behind it when you hear the words, you do the moves," said Fuimaono. 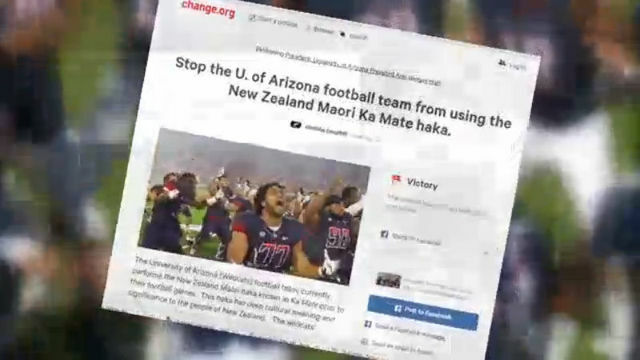 "Now, the Haka is directly talking about us," said teammate Aiulua Fanene. "Now it's just the Wildcats so we had to really dig deep." 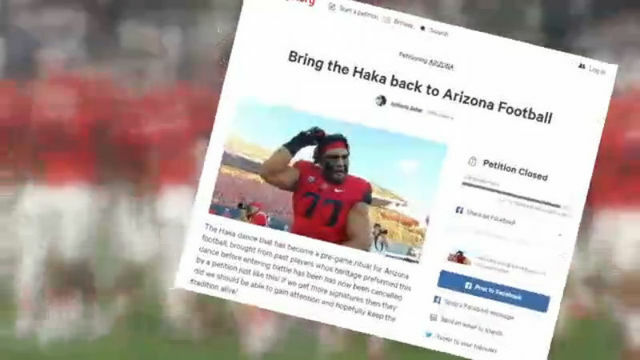 And, several games into this year, when Fuimaono and Fanene felt the team was ready, the new Haka was introduced at Arizona Stadium. It helps fire up the team before the opening kickoff. "I'm really proud of Sani," said Byrne. "The maturity that Sani and a number of teammates showed through this whole thing to take the bull by the horns and do something that works for them, as is respectful of the culture, I think is great." Head Coach Rich Rodriguez was impressed. "I told him, you've done such a great job, this will be one of your legacies." Fuimaono added, "It's an honor to know that I could leave something behind, and leave a mark on this school but was never about me, it was about paying it forward."